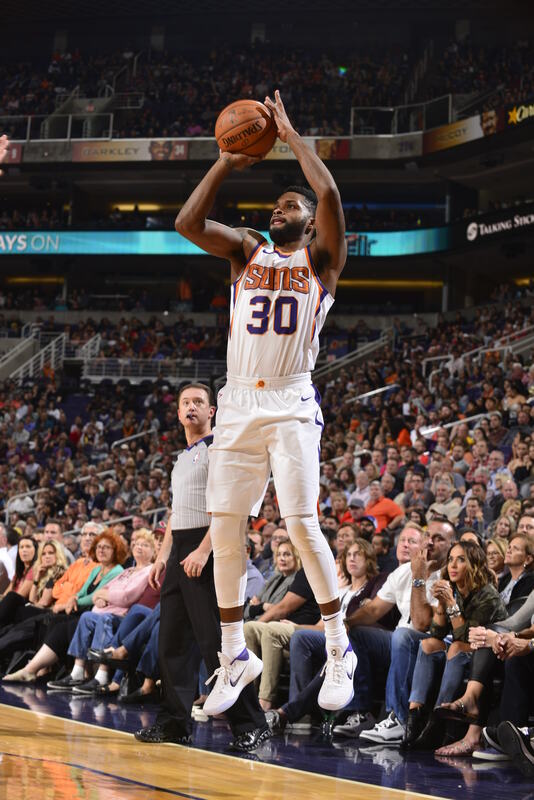 Whether it’s hitting game-winning three’s in the NBA or setting records from beyond the arc, former Rams star and current Phoenix Suns guard Troy Daniels has a knack for knocking down clutch shots. Daniels’ four-year career wearing Black and Gold spanned from 2009-2013, including the 2011 Final Four run in Houston. The Roanoke native has never been afraid to take a shot, a lesson taught by former Men’s Basketball coach and current Texas coach Shaka Smart. This mindset paid off for Daniels later in his VCU career as he hit 124 3-pointers in his senior season — a school record for a single season. He finished his collegiate career with 251 three’s, the third all-time in program history. Last season, Troy Daniels played in a career-high 79 games, averaging 8.9 points per game for the Suns. Photo Courtesy of Barry Gossage, NBA Photos. Former Rams guard and current Men’s Basketball Director of Player Development Darius Theus played alongside Daniels his entire four-year career at the Siegel Center. Daniels’ “killer mindset” carried over to the NBA. During his rookie season, he hit a game-winning 3-pointer with 11 seconds left in the first round of the 2014 NBA Playoffs, as the Houston Rockets defeated the Portland Trail Blazers. Daniels went undrafted in the 2013 NBA Draft and signed with the Rio Grande Valley Vipers, a Rockets affiliate. After being named to the 2014 D-League All-Star game, he was promoted to the Rockets. Daniels has played for five NBA teams since his debut with Houston. Daniels led the Suns in scoring back-to-back nights this season. He recorded a team-high 15 points in the Suns’ Dec. 6 loss to the Trail Blazers. Daniels also logged a team-high 18 points Dec. 7 as the Suns loss to the Miami Heat. This season, Daniels has played in 20 games, averaging 6.2 points per game.